After a while – we did see it being fully packed! It’s a popular place in Abbotsford. I ordered the Thai lemon tea and it was quite different to any standard lemon tea I’ve previously tried. It’s strong in tea flavour – a good wake up drink. Only a hint of lemon flavour. Green Curry Chicken was beautiful and creamy. With just the right amount of coconut cream. Unfortunately for the price of $17.90 it doesn’t come with a rice. My friend found it the most spicy dish compared with the other dishes. Pad Gra Pow – chilli & basil stir fry with crispy pork, $17.90 – originally thought this was a veggie dish with crispy pork but turns out to be meat > veggies. 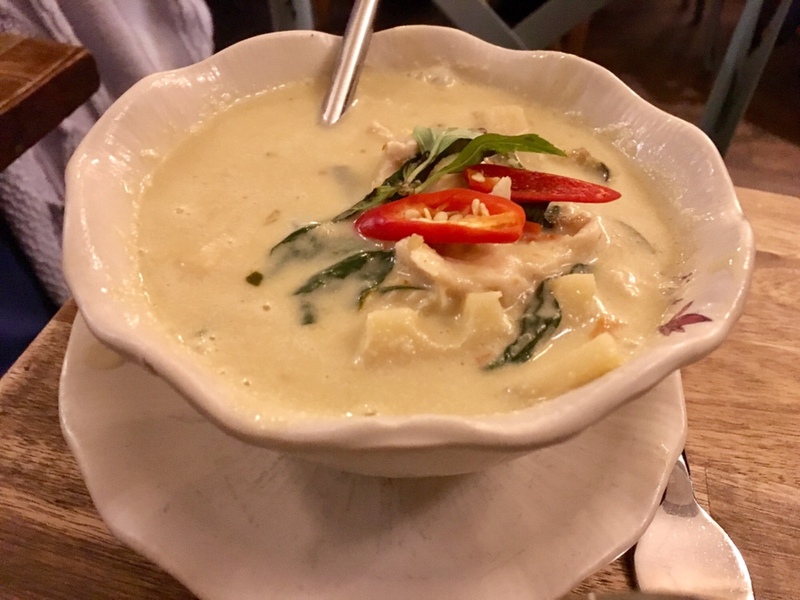 Trust that when Jinda Thai says spicy – that IT IS spicy! Larb $14.90 – hand roasted then grounded rice, crushed dried chilli, mint, red onions with minced pork. All my friends that night could take chilli/spicy food, but when they have to stop eating and go for water – it’s serious! Again another spicy dish. To sum it up: A wide variety of selections, great for group sizes of 4+. Inconvenient when unable to secure a table for large groups. Food is on point but small in portion for the price charged. For the non-spicy eaters – watch out for the spice!